The Page View is located on left top corner of the Document Viewer. Lexbe eDiscovery Platform allows you to view a PDF version of an upload document one page at a time! This can be faster when viewing large documents, particularly if you do not need to review all pages. To open the "Page View" click on any link to the document in Lexbe eDiscovery Platform, such as from the 'Search', 'Browse' or 'Facts & Issues' pages. After clicking on this tab, the document selected will be displayed. The difference between 'Page tab' and 'Doc tab' is the view of the document. For more details click here. When you open a document with multiple Bates Number, Page View also allows you to view a specific page on individual PDF (or TIFF). Please note that this feature is only available on this tab (Page View) and it is based on the Bates field entry assuming continuous Bates range within a document. If you need to add information to the document page opened, just click on the coded data fields features 'Discovery Tab', ' Notes Tab ' or 'Facts Tab' located on top-right corner of the screen. 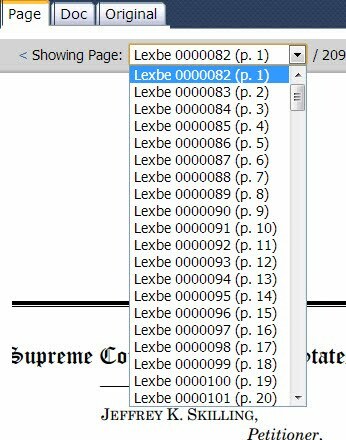 All the documents on Lexbe eDiscovery Platform are read-only. The only way to permanently change the rotation of a document is to download it, change the rotation (through Acrobat Professional or some other PDF editing software) and then re-upload the document to LO.